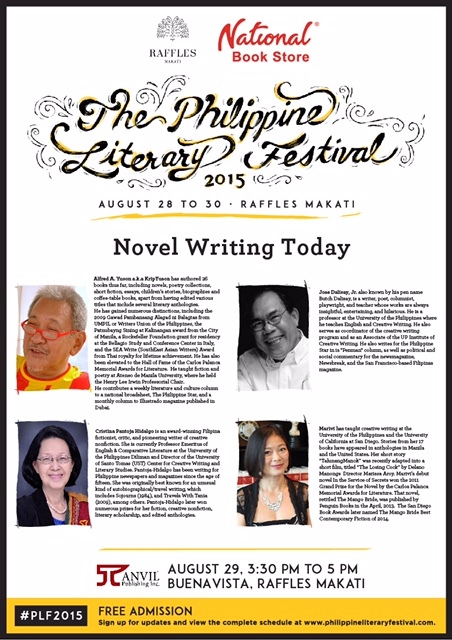 When Chad from National Book Store emailed to invite me to participate in the Philippine Literary Festival this August, I felt like Cinderella winning the Lottery. Not only would they fly me home (Woohoo! Business Class!) 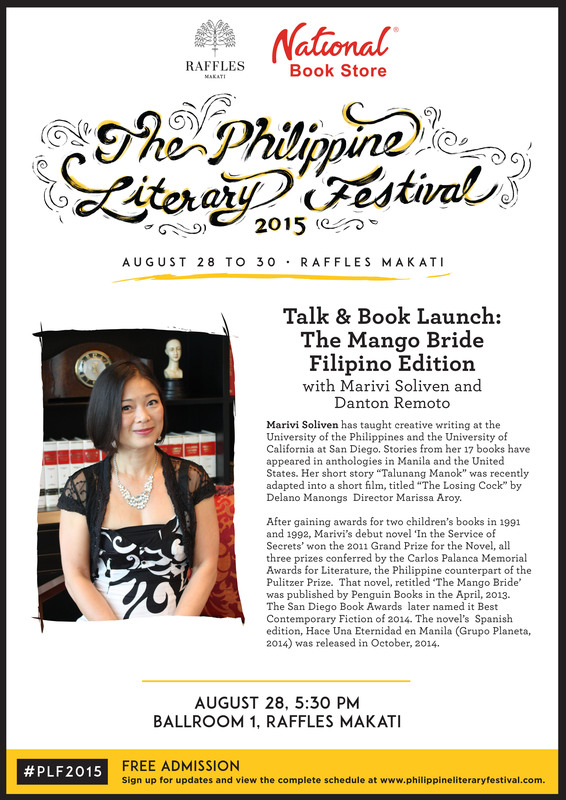 to launch the Tagalog Edition of The Mango Bride, but they would also put me up at the swankiest hotel: Raffles Makati, which hosts annual the Philippine Literary Festival. I am so looking forward to my week back home! August 28 happens to be my 20th (civil) wedding anniversary. The next best thing to celebrating with my groom of 2 decades is partying with a new Bride! Renaissance Man Danton Remoto, author, poet, professor, founder of the first LGBT party in the Philippines and host of one of the most popular radio shows in the country translated this edition and I cannot wait to see how he’s transformed my words. In between reuniting old friends and family in Manila, I hope to make new ones. 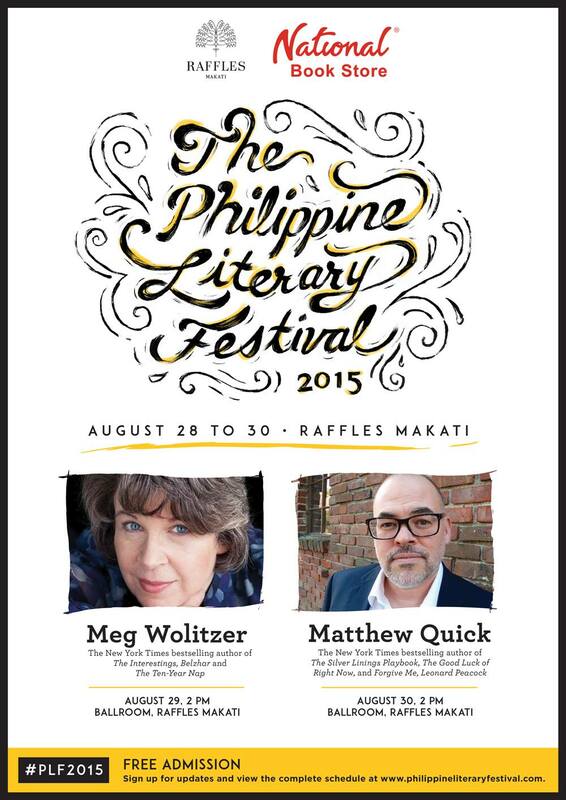 Meg Wolitzer and Matthew Quick are flying in to headline the three day festival. Dare I stalk them at the breakfast buffet? Winding up the whirl of events is media day: 11 interviews, TV and print, beginning with a 7:30 a.m. CNN Philippines chat. The anchorwoman looks like she moonlights as a supermodel. I’m hoping we can sit for the interview. The morning of September 2 I’ll do a campus talk at Ateneo University, then fly back to California that evening. No time for jet lag in this action-packed week, but as far as I’m concerned, this is as good as it gets. Congratulations Marivi. I am so proud of your continued success. Whoohoo! as you would say. B8ut of course, you’re a celebrity, Marivi! Happy for you ! But sorry I’ll kiss you. Flying tomorrow to SD for a couple days. Will be thinking of you.